Far from the spotlight of American media and politics — where debates rage on about racism, gun violence, immigration, poverty, LGBT equality and a struggling bipartisan government — a harsh reminder was issued to those who still wonder why so many high-profile athletes are hesitant to stand up and speak out publicly about polarizing social issues. For decades, the commonly accepted narrative has been that famous athletes aim to stay out of controversial situations primarily for financial reasons; that they don’t want to alienate consumers, cost themselves potential endorsement opportunities, or risk being blackballed by the teams and leagues that pay their lucrative salaries. And while that may be true in many cases, an underrated factor in those decisions is safety. Not enough consideration is given to the possibility that some athletes choose to stay out of controversy because it’s literally a matter of life and death. In the aftermath of a failed military coup in Turkey, Enes Kanter of the NBA’s Oklahoma City Thunder received numerous death threats for his outspoken opposition to Turkish president Recep Tayyip Erdogan. Kanter, 24, was born in Switzerland but his parents are from Turkey. He is a practicing Muslim. 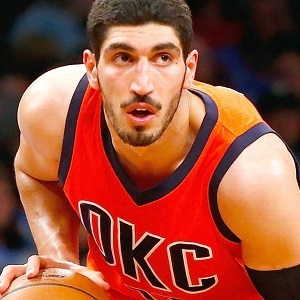 Kanter began his basketball career as a teenager in Turkey before coming to the United States, where he spent a year at the University of Kentucky before being selected No. 3 overall in the 2011 NBA Draft. Since then, he hasn’t been shy about speaking his mind on controversial issues, usually through his Twitter page. Kanter publicly supported fellow NBA player Dion Waiters — a teammate of his on the Thunder recently — after it had been reported that Waiters refused to stand for the U.S. national anthem due to his Islamic beliefs. Kanter has also been critical of President Ergodan and the Turkish government on social media. While it’s likely Kanter was bashed and/or threatened in the past for those statements by those who disagreed with his stance, apparently things took on a more serious tone at a time when Turkey’s government was under siege and political and social tensions were obviously very high. If that is what athletes face for completely innocent actions, imagine what they might get for taking an unpopular stance or for offending someone’s beliefs or values. And now that Internet anonymity via social media has become the white hooded sheet of the 21st century, online thugs are even more emboldened to make threats without fear of consequence or accountability. The Holy Quran instructs citizens to obey “those in authority among you” (4:59) and reminds us that a corrupt leader is only the product of the corrupt society that produced them (6:129). However, social activism is not discouraged in Islam (13:11). The turkish situation is very interesting. I wish there where more in depth sources of information regarding the situation there.